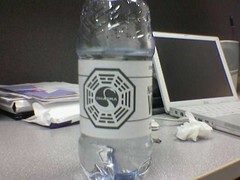 I put a ‘Dharma Initiative Natural Island Spring Water’ label on my water bottle, but no one here gets it. Disclaimer: Do not drink if pregnant. I’ll put it on the pulpit on a Sunday!